There’s a bit of a lull right now, as far as workshops and classes go. I taught a number of classes in the last two months at UNM, Harwood Art Center, Oasis Albuquerque and at my home studio. I’m going to be out of town/country through the end of June, so the next class (or any new classes I set up) will be in July, 2019. Please contact me if you are interested and I will put you on my mailing list, to which I send any breaking news about new classes/workshops! I’d like to post more recent pictures of student art from recent classes, but I can’t remember how to do that right now… I have a Facebook page, Miraflores Mosaics, and you can find pics of student pieces from recent classes there. Scroll down for workshop listings by date. New classes and workshops are scheduled regularly. To be the first to learn about them, contact me and I will put you on my mailing list! I hold customized group workshops, too. A great idea for birthdays, families, (each family member makes a tile and we can join them together on a table top to make a family heirloom), baby showers, corporate team building, senior activities, field trips, groups of people who are disgruntled that my regular workshops are filled up, etc. Groups of 6 - 14 are held at my home studio in the Albuquerque north valley. Groups of 2 - 4 meet in my studio at Harwood Art Center. Contact me to book your next event. 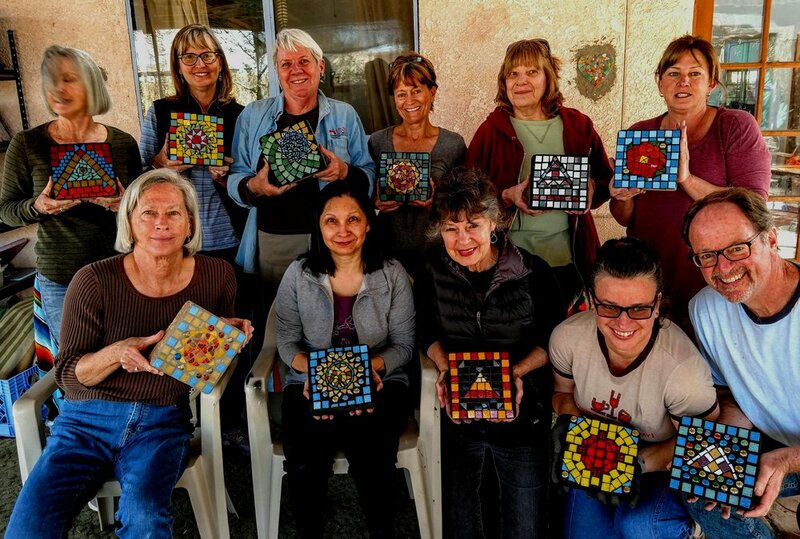 There will be a thinset workshop at my house in August, mosaic classes coming up at Alegria (a retirement community in Bernalillo), a two day workshop through Oasis and one through UNM. They are all full. I also have two 6 week mosaic classes through UNM starting on Sept. 12th (one in the afternoon, one in the evening.) I don't think they are posted yet so, if you are interested, watch for them because they fill up quickly.